Old fluid needs to be completely flushed-use clean new fluid. 1 1/16" Left inlet, 7/8" Top Inlet, 1 5/8" Right Inlet, 1 1/16" Right Discharge. Fits John Deere models 4320, 4520, 4620, 5440 Forage Harvester, 6404A Eng, 6404T Eng, 644 Indust/Const, 646 Compactor, 646B Compactor, 690 Excavator, 690A ExcavatorReplaces AR101807 This part is for for U. 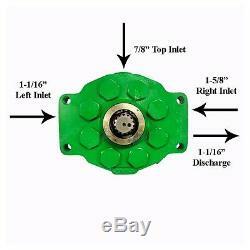 The item "Hydraulic Pump John Deere 1640 2040 2140 2955 300 300B 3010 3020 302A 310 400 40" is in sale since Thursday, December 13, 2018. This item is in the category "Business & Industrial\Heavy Equipment, Parts & Attachments\Heavy Equipment Parts & Accessories\Antique & Vintage Equipment Parts". The seller is "justauctions" and is located in Grand Rapids, Michigan. This item can be shipped worldwide.